"IT'S SIMPLE AND IT WORKS"
GREAT GIFT FOR YOUR GLOCK. GET ONE! Ergonomic 45-Degree Offset. Night Operable. Never Fogs. Patented Technology. Smart Design. Easy Installation. 3-Gun Champion, IPSC Grandmaster and USA Team World Shoot Gold medalist, Barry Dueck. Dueck Defense, Inc.’s primary customer is the US Military where the focus is on building the very best for the troops’ use in the field. The DD Rapid Transition Sites are proven in the field where fluid target engagement ranges are presented. The original LAPD SWAT Team stocks and deploys the Dueck Defense, Inc. offset iron Rapid Transition Sights™ on their weapons. Near range targets can be engaged with the flick of the wrist, saving time and lives. Most 3-Gun and Multi-Gun competition shooters require minimal practice to feel comfortable competing with Dueck Defense, Inc.’s Rapid Transition Sights™. Watch any major multi-gun competition and you will see our offset BUIS being used by top competitors. 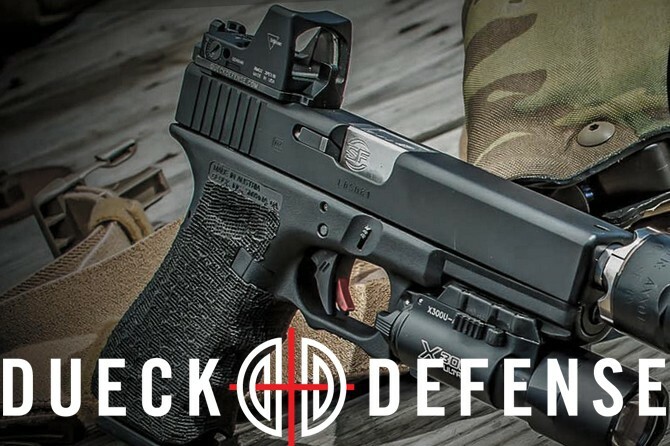 The superior quality of Dueck Defense, Inc.’s Rapid Transition Sights™ make them the ideal backup sight for sportsmen hunting in cold and wet conditions. Fog, condensation or dead batteries have zero affect on these lightweight and durable American Made offset BUIS. CHECK OUT OUR NEWEST HANDGUN ACCESSORIES. with or without a premium front night sight. Just align the fixed iron sights and your red dot is visible. It’s simple and it works. Check out the latest media coverage on Dueck Defense, Inc.